(a) Male holotype; (b) female in typical upside-down posture on young foliage of host (Callitris gracilis). We report the first discovery since the 1970s of a new extant family (Aenigmatineidae fam.n.) 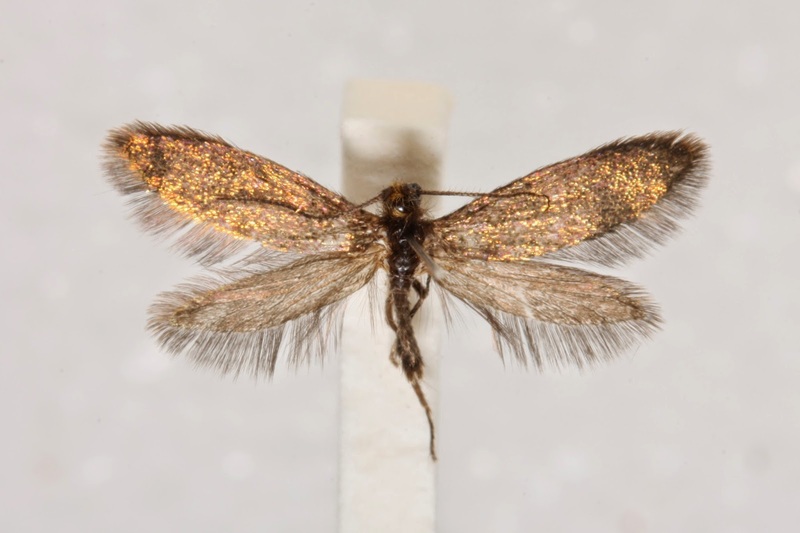 of homoneurous moths, based on the small Aenigmatinea glatzella sp.n. from Kangaroo Island off southern Australia. It exhibits a combination of extraordinary anatomical characters, and, unlike most homoneurous moths, its larva is a conifer-feeder (stem mining in Callitris, Cupressaceae). 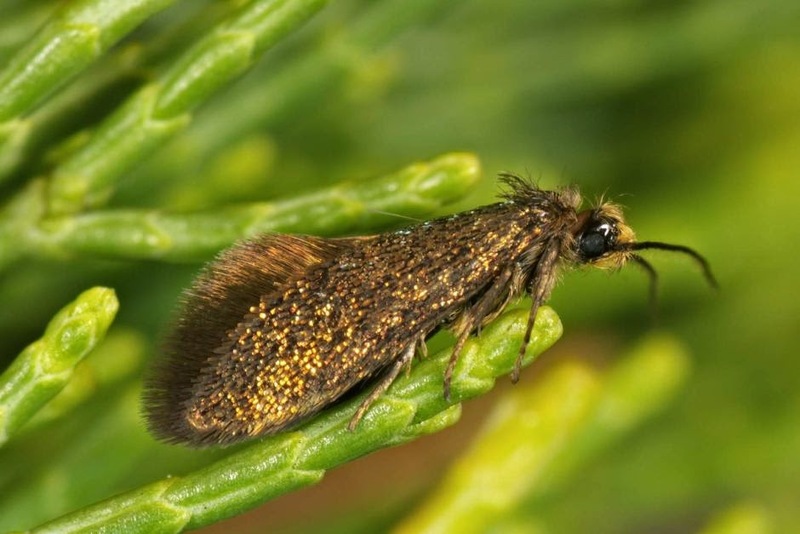 While the adult's mouthparts are strongly regressed, evidence from other morphological characters and from a Bayesian analysis of 25 genetic loci convincingly places the taxon among Glossata (‘tongue moths’). An unexpected tongue moth clade including Acanthopteroctetidae and Neopseustidae, suggested with low support in recent molecular analyses, remarkably becomes strongly supported when Aenigmatinea is included in the molecular analysis; the new taxon becomes subordinated in that clade (as sister group to Neopseustidae) and the clade itself appears as the sister group of all Heteroneura, representing the vast majority of all Lepidoptera. 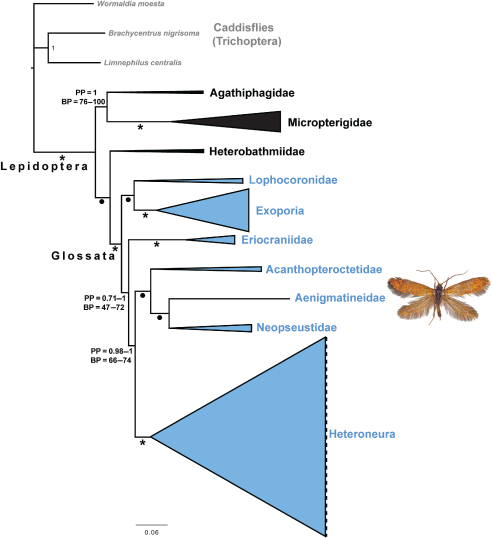 Including Aenigmatinea into the analysis thereby strengthens the surprising indication of non-monophyly of Myoglossata, and the new phylogeny requires an additional number of ad hoc assumptions of convergence/character reversals in early Lepidoptera evolution. Aenigmatineidae Kristensen & Edwards, fam.n. Aenigmatinea Kristensen & Edwards, gen.n. Diagnosis: Adult moths (Fig. 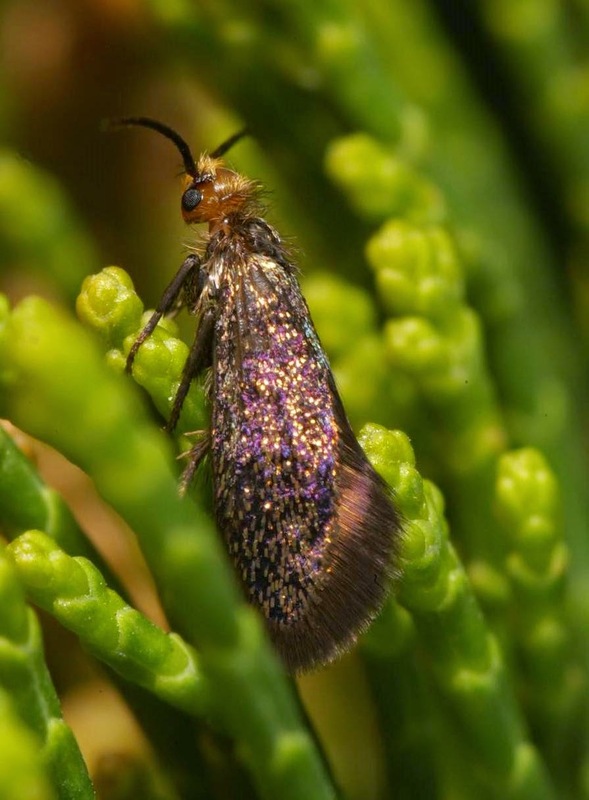 1a) small, forewing length ≈ 4 mm, immediately recognizable by unique combined presence in the forewing (Fig. 3f) of a prominent jugal lobe, an only two-branched radial sector and a single-branched medial vein. Etymology: Gender feminine, referring to enigmatic character combination; the Linnean Tinea comprised the many small moths, including the small homoneurans, whose wing posture in repose made them appear cylindrical (‘Alis convolutis fere in cylindrum…’) (Linné, 1767); glatzella: Adjective, gender feminine, honoring the moth's discoverer R. V. Glatz; the name also alludes to the unusual dearth of head scales, Glatze being German for a bald head. Figure 5. Cladogram of basal (non-ditrysian and lowest-grade ditrysian) Lepidoptera. Trichopteran outgroups shown in grey. Branch support is as follows: *, posterior probability (PP) = 1, maximum likelihood bootstrap (ML BP) = 100; •, PP = 0.99–1, ML BP = 90–99; or as shown on branches themselves. ‘Jaw moths’ shown in black, and ‘tongue moths’ in blue. Width of terminal triangles approximates the number of described species (van Nieukerken et al., 2011) in each lineage: Micropterigidae (160 spp. ), Agathiphagidae (two spp. ), Heterobathmiidae (three spp. ), Lophocoronidae (six spp. ), Exoporia (636 spp. ), Eriocraniidae (29 spp. ), Acanthopteroctetidae (five spp. ), Aenigmatineidae (one sp. ), Neopseustidae (14 spp. ), and Heteroneura (156 568 spp.). Niels P. Kristensen, Douglas J. Hilton, Axel Kallies, Liz Milla, Jadranka Rota, Niklas Wahlberg, Stephen A. Wilcox, Richard V. Glatz, David A. Young, Glenn Cocking, Ted Edwards, George W. Gibbs and Mike Halsey. 2015. 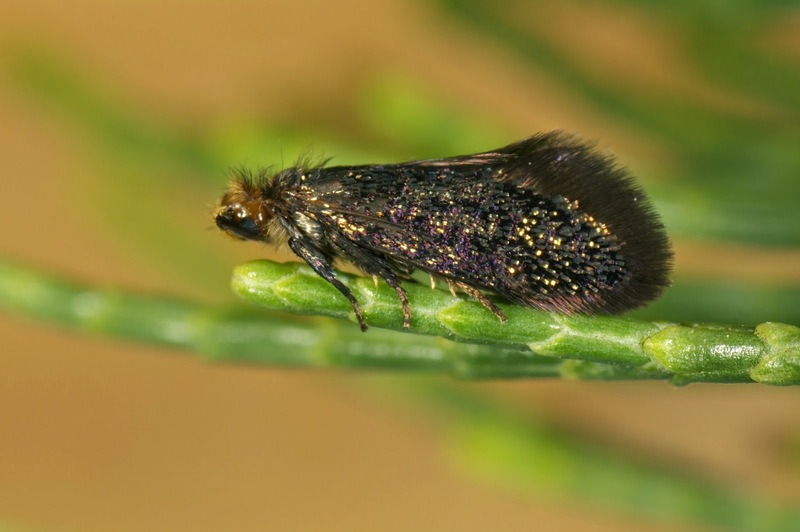 A New Extant Family of Primitive Moths from Kangaroo Island, Australia, and its significance for understanding early Lepidoptera evolution.